Whether your main workout jam is a Taylor Swift pop ballad or a pulsating EDM track, music is scientifically proven to make you work harder during exercise. And while the "Power Playlist" you made in college might be enough to get you through a turn on the elliptical, when it comes to really tough sweat sessions, a little new inspiration can go a long way -- like another half-mile, or set. 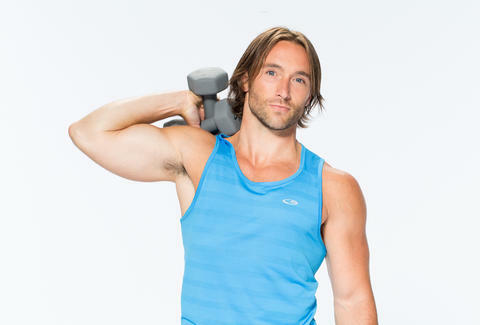 That's why we asked Adam Rosante, fitness and nutrition coach and ambassador for C9 at Target, for the music that motivates him through a particularly grueling workout. Here's a 20-minute playlist from the author of best-selling exercise book The 30-Second Body to fuel your next effort, which might as well be a 20-minute workout. For more exercise inspiration, be sure to visit Rosante's YouTube channel, where he releases a new workout video every week. Sign up for updates at AdamRosante.com. Erin Kelly is a New York City-based writer, runner, and triathlete who will be putting this playlist on repeat for the next six weeks. You can follow her on Twitter at @erinkellysays.